Many people get a credit card and begin spending without giving much thought as to how they will make their payments. When they receive their statement at the end of the month, they often do not have the money to make the payment. In cases like this, credit card holders quickly begin to experience late payments, late fees and a credit score that begins to fall dramatically. However, with careful planning and hard work, it is possible to maintain or regain control of your credit card debt. If you are one of the millions of Americans who is dealing with harassing calls from creditors and want to begin eliminating your debts, there are a few key steps that you can take. If you carry around your credit cards in your wallet, the temptation to use it for random purchases throughout your day will be great. So instead of spending frivolously with your plastic, take your credit card out of your wallet and leave it at home. Taking this simple step can work well to avoid making impulse purchases and prevent your balances from rising. While it may be easy to tell yourself that you’ll only use your credit card “this one time,” chances are that your one-time purchase will snowball into more spending. And we all know that more spending leads to higher balances and eventually, much larger monthly payments. One of the very first steps in getting out of credit card debt is to stop spending. So take your cards out of your wallet and only spend what you have in cash or in the bank. If you’ve already reached your credit limit on one card, it can be very tempting to open a new line of credit to make up for it. This is a bad choice for your financial future and although many people make this mistake everyday, a new credit card will only set you further away from your goals. It is also important to keep in mind that paying credit with credit is a very costly and negative cycle. While it may save you in a pinch, in the long run, you aren’t actually paying down any of your debts. Using credit to pay off other debts will only make your total balance owed grow larger and increase those pesky interest costs as well. Remember that they only way to pay off your credit card debt is to stop accumulating more debt. One of the biggest mistakes you can make when trying to pay down your debt more quickly is to make big payments that you can’t really afford. If you repeatedly make large payments to your credit card that don’t leave you with enough cash in your bank account, chances are that you’ll need to use your card again to pay for everyday expenses. This is a very bad habit to get into. Stop yourself from repeating this vicious cycle by setting up automatic payments that work to coincide with your paycheck. By ensuring that your credit card payments are reasonable and fit into your monthly budget as a fixed expense, you can start to gain traction and pay them down. If you need to cut down in other areas to make your credit card payments each month without using the cards again, do it. 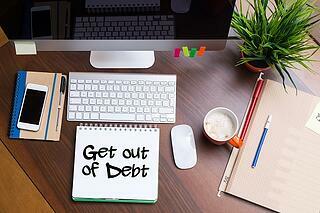 Many creditors are willing to work with debtors who are proactive in paying down their credit card debts. You can always reach out to your credit card lender in an attempt to negotiate new terms by setting a smaller minimum payment or lowering your APR. If you are a longtime customer and have a good payment record, creditors may be more likely to work with you. By carefully explaining your situation and letting them know that you're serious about paying off your debt, you may be able to strike a deal. While they may say no, keep in mind that when it comes down to it, it never hurts to try. If you are having difficulty finding another way to pay off your credit card debt, filing for bankruptcy can effectively put a stop to harassing calls from creditors and help you to take control of your financial future. Filing forChapter 7 bankruptcy works to quickly wipe out all of your unsecured debts, including credit card debt. Alternatively, Chapter 13 bankruptcy can be helpful to restructure your debts into a payment plan that extends over the course of 3 to 5 years. However, there are long-standing consequences that can stem from declaring bankruptcy, so the decision should not be taken lightly. While it may seem impossible right now, you do have the power to get out of credit card debt. Whether you need to keep your credit cards at home to stop spending or you are in over your head and are considering the bankruptcy process, there is an answer that will work for you. Interested in learning more about the process of filing for bankruptcy in New Jersey? If you are ready to take control of your financial future and think that declaring Chapter 7 or Chapter 13 bankruptcy may be the right option for you, our skilled and knowledgeable bankruptcy attorneys can help. Call (800) 412-5091 or visit the team at Scura online today to schedule a bankruptcy consultation.